The fish pond in 1920. This stretch of water was there before Jesse Boot's lake. Photograph courtesy of Nottinghamshire Local Studies Library. In about 1920, soon after the end of the First World War, Jesse Boot bought the Highfields Estate. He had long been impressed by what the Cadburys at Bourneville and William Lever at Port Sunlight were doing to house their workers in decent homes alongside purpose built factories. Now Jesse Boot wished to do something similar at Highfields. Before he could embark on his plans, Boots were taken over by the American, Louis K. Liggett of the United Drug Company. It soon became apparent that United Drug were not going to take up Jesse Boot's scheme for a new model town and so he was obliged to reconsider what should be done with the Estate. Thirty five acres he subsequently chose to give as a site for new buildings to house University College. About another one hundred and fifty acres Jesse Boot decided should be laid out as the public park we now know as University Park or Highfields and which is the subject of this article. Jesse Boot had decided to construct, at his own expense, a new road across the Estate to provide a more direct route between Nottingham and Beeston; this road, University Boulevard, was to cost him in region of £200,000. At the same time the land on either side of this new road was to be laid out as a park. As the photograph below clearly shows, Highfields already had its own rather idyllic stretch of water, known locally as the Fish Pond, but the decision was taken to dispense with this in favour of a much larger lake. 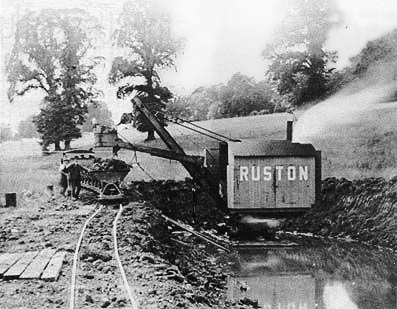 The firm employed to carry out the lake's enlargement was instructed to dump the excavated spoil on the line of the new boulevard. In this manner the roadway was raised up in the hope of preventing possible floodwaters from the Trent spreading right across the parkland (*). Work on the lake's enlargement began in 1922 and wasn't completed until 1925. It would appear that parts of the park were opened as they were finished, and that there wasn't a specific opening date. In all probability the public wasn't granted full use of the park until about 1926. 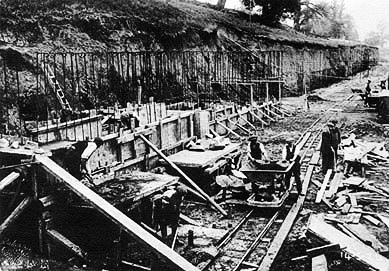 Work on one of the embankments at Highfields in 1924. Back in 1923 Jesse Boot had formally handed the City Council the deeds to the parkland, but during his lifetime chose to retain control of the park's management. Through the Sir Jesse Boot Property and Development Company, his own park staff was employed to maintain the grounds, supervise the sports facilities and manage the catering from the Tea Pavilion beside the lake. This arrangement continued until 1932 (Jesse Boot having died in June 1931) when the City Council formally adopted the park. To offset the extra expense to which the Council would now be put, Jesse Boot had even left a gift of £30,000 specifically to help with the park's upkeep. The park must undoubtedly have changed over the years, if only because the trees and bushes have grown bigger, but in many respects the park remains much as it was when it first opened. The rowing boats and canoes still make their first appearance of the year in the week before Easter and stay out for hire until Goose Fair Sunday. The launch may not be quite as popular as in former days but it still goes out if requested on Sundays and can always be hired by parties during the week. George Horton, after helping countless thousands into and out of their boats, with his merry quips, is no longer still around, but others have taken his place. The ducks are still there, though their numbers are somewhat diminished at present owing to depredation, a couple of years ago, by gypsies camping near the lido who proved rather partial to roast duck. A start is made on digging out Jesse Boot's new lake. Jesse Boot gave permission for the Trent Fishery Board to use the lake as breeding waters and as a stock pool for fish. As a result anglers were not permitted to fish there. This arrangement continued after the City Council took over the park and even now each March Severn Trent come and net fish which are taken away to stock depleted waters elsewhere in the district. Another prohibition within the park was against swimming in the lake, but then Jesse Boot had provided alternative facilities only a stone's throw away at Highfields Lido, in its day the largest open-air swimming pool in the country. 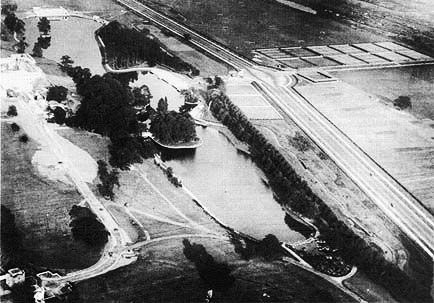 Initially the lake provided the water source for the Lido and each Sunday the Lido would be emptied and water pumped in from the lake. When the City took over the running of the Lido in 1932 it was felt this was unhygienic and rather wasteful and instead a filtration unit was installed. Away from the lake there are other sporting activities on offer. The putting green is open during the same period of the year as the boats. There used to be two greens but golfers were rather prone to knock their balls into the Tottle brook and so now their activities are confined to just the one green. Three bowling greens are laid out beside the south entrance to the park. All the necessary equipment needed to play bowls can be hired for a modest sum and the greens are available for use from late April right through to early October. The five croquet lawns on the other side of the south entrance started out life as a dancing green. Evidently dancing outdoors didn't go down all that well, as it wasn't long before the Nottingham Croquet Club moved in. Unlike other facilities in the park, croquet isn't really on offer to casual users. To join the club would cost most locals £20 a year, students £7 and juniors £3.50. This includes the use of all necessary equipment and there are no further charges. If you wish to try-out the game, you can apply to join for a six week period which costs £6 but this sum is subsequently taken off the cost of a full membership if you decide to continue playing. Across on the other side of University Boulevard are facilities for more energetic activities. The park has the biggest single block of tennis courts in the country. Although some of those 36 courts are often hired out to private tennis clubs, there are always courts kept available for the general public. Other sports such as football, cricket, hockey, lacrosse and this year even baseball can be played there. Admittedly pitches have to be booked in advance but the cost is quite reasonable and they can even be hired on a one-off basis. 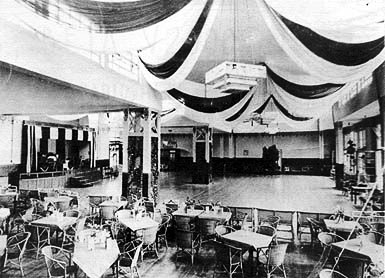 The interior of the Lakeside Pavilion soon after it was opened. Music is one feature of the park which now we seem to have lost. On Sundays bands often used to play outside on the dais at the front of the lakeside pavilion. Inside there were once frequent dances. No doubt some of our older readers remember these. Back in 1934 the lakeside pavilion was leased out to the University College for 'educational purposes' and this arrangement prevails to the present day. It means that the University are responsible for all the catering and oversee the functions held there. The pavilion, however, doesn't seem to be used very much these days and perhaps it is time the City Council came up with a more imaginative policy regarding its use. Certainly the Council appear to have plans for other parts of the park. It was recently announced that an indoor tennis centre across on the other side of the Boulevard is in the pipeline and it is confidently expected that hockey players will soon be provided with two all-weather pitches. The paddling pool is permanently out of commission because it is considered unhygienic, but it is hoped that when funds become available it will be possible to re-site it at the pavilion end of the park. The Council has just spent some £50,000 having the western end of the lake dredged to remove all the silt which had accumulated there over the years. The water cascade has now been repaired and this should once more become an attractive feature of the ornamental rockery at that end of the lake. 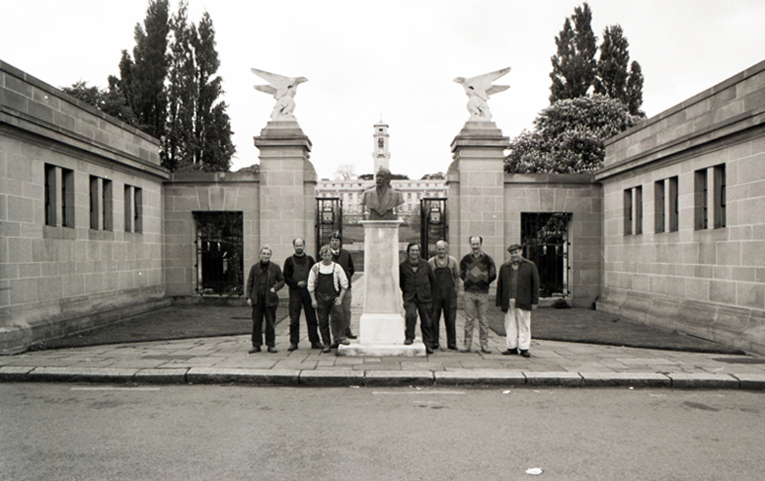 Some of the park's staff posing by the bust of Jesse Boot at the park's main entrance on University Boulevard in 1987. (*) The river Trent was always liable to burst its banks after prolonged heavy rains until the mid-1950s when effective flood prevention barriers were constructed.